Thank you for selecting the endodontic office of Dr. Soham Patel. We are an endodontic specialty practice dedicated to exceptional care using state-of-the-art technology. Our Mission is simple: to provide you with the finest endodontic treatment available. We work carefully and efficiently to achieve optimal, long lasting results. Our caring staff provides a welcoming and relaxed treatment atmosphere. We take the necessary steps to ensure that your root canal procedure is both comfortable and stress free. We also work closely with your general dentist and other specialists to provide you the best care possible. 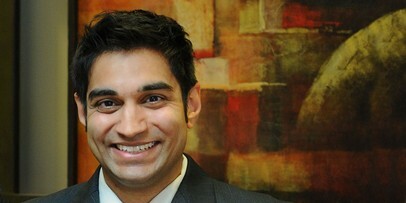 Dr. Patel is available during and after office hours to answer any questions or address any concerns you may have. When you come to our office, all of our efforts are for a successful treatment result and a pleasant patient experience. Our office is known for its commitment to excellence. We use the latest technology including the surgical operating microscope which offers increased magnification and illumination for all procedures. 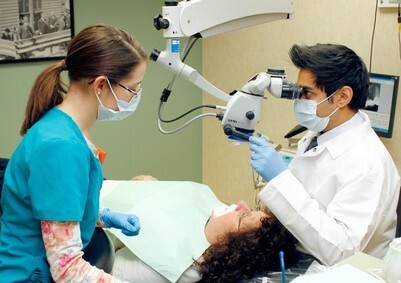 Whether we are evaluating the outside surface of a tooth for a crack, locating miniscule root canals, removing a broken file from a root canal, ensuring the canals are thoroughly cleaned, or filling the root canal systems, the microscope benefits treatment. Even the smallest detail is brought clearly into view. We also replace conventional dental x-rays with digital radiography. This advancement significantly reduces radiation exposure to our patients and eliminates the hazardous byproducts of film developing. We utilize digital record keeping and use of the Internet for the convenience of our patients and referring doctors. For example, we encourage you to pre-register at this web site to save you time when you come to our office for your appointment. It is simple to use. Please call our office for instructions. We understand that dental anxiety is prominent and can deter many patients from seeking care. For patients with dental anxiety, our office offers both anxiolytic medication and nitrous oxide sedation. Please call our office to learn more about these options.